Eye works by the glass-wonderful artist at a multi-month exhibit. Eye works by the glass-wonderful artist at a multi-month exhibit. It opens at the Catalina Island Museum on Sunday, March 26. MARCH 26 THROUGH DEC. 11, 2017, and it will boast a caboodle of twisty, curving, hue-packed, ethereal pieces. 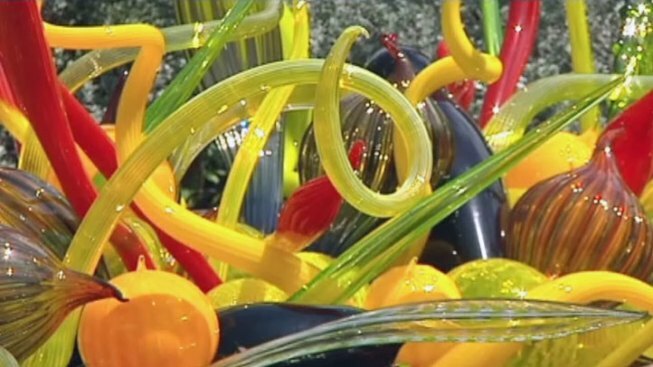 This is "the second major exhibition of Chihuly's work in Southern California," and the pieces will be displayed in the museum's "outdoor atrium" and in the "landscaped gardens" (which possess "...views of Catalina's canyons and clear waters"). If you're pondering Chihuly works you've seen in the past — perhaps the ceiling of the Bellagio in Las Vegas or a botanical garden-based show — count on seeing the color and glinting-light gorgeousness that you've known in the past. "Seaforms" and "Red Reeds" are just two of the pieces in the show. Ready to indulge in some glass-lovely art enjoyment on a light-laden island? The notion of glass and Catalina just go together, from the aforementioned glass-bottom boats to the wide-of-window'd buildings that look out onto the harbor. It's an ideal place for the Washington artist's works to glimmer.